Says last DA wasn’t happy. Says we did hell of a job at state level. Randi taking DeVos to a school. Says it’s good. Says he invited her here. Is going to Ohio district that voted 80% for Trump. She proposes to cut their budget. Best thing nationally. Many budget cuts on horizon. Calls it circus. Who’s got worse haircut, guy in Korea or US? People who think a lot about themselves walk around with hair like that. Everything is cuts, going after workers, new SCOTUS justice. We will prepare, but when all you see is ed. cuts, and we know Janus, new Friedrichs coming later this year, we have a clear path on what we have to do. What Randi is doing is important. Public school proud important, but Texas is outdoing us. They have sustained statewide campaign. Fought vouchers. We in NY need to work with other teachers across country to protect and support our schools. Do they want to fight every PTA in US? We will see they do that. PTAs not red or blue. Not political—people love their kids, their kids’ schools, and will protect them. We have to remain focused here. Good news—was talking about eliminating charter cap and removing geographic cap. Wanted to change regs on use of public school space. Wanted to unfreeze tuition. Went to Albany to educate people that charters asked for freeze. Used to be three year lag. We faced cuts in recession. Charters got increases because they had a three year lag. When it was their turn to get cuts, they froze their tuition. Charters felt they were owed money. Not understood by media. Also wanted to get rid of millionaire tax. Media was focused on DC. We beat them at every turn. Caps in place. Space regs unchanged. We didn’t unfreeze, and also got rid of their lag. We should get more per student because we have all the challenging students. They can be expensive. Very proud of work of this union. Always Senate GOP opposing us. We asked local GOP to stop voting for this. Visited them, made it happen. We have 1.1 billion increase for ed. NYC 4.7% increase. Foundation formula helps. Millionaire tax extended two years. 40% increase for NYC Teacher Center. Union dues tax deduction for state of NY. Next challenge is Constitutional Convention. Vote no. AFL-CIO hired campaign manager for Constitutional Convention. Will not be easy fight. Really bad people working against us. First goal is approval, will say anything to anyone to get it. Will be real fight. From now until end of summer, it’s engage members. We think it’s important that state keep deals with working people. We will remain diligent. Please remind everyone. Will be heavy push in September. We are pushing back on ESSA and value added scores. We believe in May we will see changes in CTE regs. Our political action coordinators working hard, need meetings with city council people. City in good shape right now, but everyone keeps talking about what feds will do to us. Many contingency plans. Many potential cuts. State also worried about cuts. Told pols you can’t cut schools once you set up school years. We are at highest funding level. NY State setting up to be anti-Trump place. Rejects idea of rejecting safety net. Says people tell him governor should burn in hell. Says NY Post in 11th circle of hell. But we talk to them when they call. Look at budget this year, protecting schools. He had a part in it and we helped him get there. With city budget teachers choice, positive learning and many issues, but wants us to engage. We need to know if our locals will stand with public schools when feds come to destroy us. Worked with city to change lead in water protocol. We can’t be outdone by Texas. Want to do a lot of grassroots events. School and borough based. We need to make big loud noise in September. Will do UFT van and celebrate. Asks we engage. Asks we engage in Public School Proud. On May 1st 4.5% pay raise. Will be reflected on May 15 paycheck. Asks we make it clear at workplaces. Ends report 5:02. Howard Schoor stands in place of LeRoy Barr. HS awards April 28th, 5:30 PM. May 6, 5K run. May 13th spring conference, Rev. Barber. May 15th, immigration meeting 4-6. Will give advice. Mulgrew says first Dreamer has been deported. CL—On lead in water—PS 289 had high level—worse than Flint—what are our procedures? Once spigots identified, they are turned off. Schools are informed. Staff should be told. Recommends you see doctor. Asks you be tested. Refer parents to principal. CL—Now that ELA finished, math coming, teachers told they won’t receive preps that day. Tell DR they must contact superintendent, if that doesn’t work, contact me. We have rules and laws. There’s a law that says you can go to bathroom, in fact. This is not an emergency. They knew two months ahead of time. CL—Student led parent teacher conferences—Some teachers volunteered, was flagged in principal’s PPO that not all teachers did it. How do we go forward? You need SBO, cannot be mandated. That means superintendent is an idiot, doesn’t understand that she has to work with people. We have schools who SBO them. They like them. Cannot be mandated. CL—After election of Trump many members ushered in Prez. Now they see what we’ve been talking about and feel union pride. How can we keep that going? Our strategy is to take pride in what we do. Tactic we need is to embrace schools and have communities feel the same. We will deal with Janus. We will attack them on anti-union stuff. Asks they do Public School Proud piece. CL—mayoral control will come up. Heard you say you are for it with changes. Can you tell me what those changes are? Chancellor not accountable to parents, abusive principals problems. We are on record. We have a resolution. We want mayor to lose control of PEP panel. We want CEC approval on spaces. NY is only one form of mayoral control. We have most stringent. Doesn’t matter who mayor is, they think if you change it it won’t be control. We decided our form better than school boards. Were not good old days. Funding and nepotism issues. We didn’t get our form, don’t know when it will get done. Union has official position, has been voted on by this DA. Delegate—NYSUT catastrophic insurance—are we communicating this to members? Plan hasn’t been open for almost six years. Open period for first time. Gives you additional medical coverage. Has saved a lot of union families. Will put out a blast on this because it’s very important. You don’t know you need it until you do and then it’s too late. Paul Egan—DA endorses for Brooklyn DA and Manhattan DA—this month. Delegate moves for resolution for next month—in support of CPE 1. CPE 1, wonderful school and community, thrown into turmoil by abusive principal. Targets teachers, families, children. First LIF last Feb., second last Feb, reassigned quickly. All vet teachers under investigation. One found unsubstantiated but SCI wouldn’t use word. Parents working tirelessly to protect teachers, children, culture and school community. Chancellor unresponsive. Teachers need help of union. You said we will bring 800 pound gorilla down, please move this for next month. Howard Schoor—Asks if it’s same as EB, told no. Says similar resolution came to EB. Voted to table it. Asks you vote against it, not that we disagree. If we pass this we shut down all communication with DOE. We would have to do all these things. LeRoy Barr was there at SLT. We had 15 people there. Names people giving support. Says it is DOE problem to resolve. Mulgrew says we are having conversations. Says it’s nasty situation. We are trying to resolve it. Thinks we’re getting there. Says it was tabled. We’re asking DOE to stop playing games. Says you can write this on your blogs. Says we are standing and doing all we need to do. Parliamentary inquiry—James Eterno—Last two meetings I was out of order. Told last month I could not move to amend resolution. Says he could have. Eterno—five speakers in favor of de Blasio, one against, chair should alternate. Eterno—Says you should alternate with opposition. Mulgrew says he’s out of order. Eterno—Can you respect order of inquiry, or taking turns? Mulgrew—We will continue to select everyone. You don’t think people have right to express opinions. Support of Andrew Hevesi’s Proposal—Paul Egan asks for support of home stability. Help resolve homeless situation in NY State. 150K homeless kids right now. More than 80K NYC facilities on brink. Would help with rent and keep them in homes instead of shelters. Will save state and city millions. Will save 151 million in NYC in one year. Feds will pick up cost for five years. Point of info—What is difference between this program and Bloomberg’s program to put homeless into apartments? Present mayor eliminating that program. Egan—Provides families with income to stay in their own place until they are stabilized. Speaker stands in agreement. Has two kids in class in shelters. Parents have to bring kids from Brooklyn to Bronx. Asks for support. Health Care for All—Ellen Driesen—Saw show in DC when they decided to repeal and replace, was great entertainment, but many people are at risk. DC crew wants to eliminate health care for 24 million. Unacceptable. We need to push for single payer. We need to get word out and lobby hard. 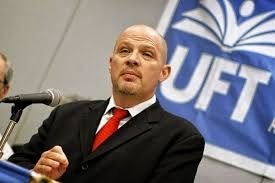 Mike Schirtzer—MORE--Motion to amend—additional resolved at end—Resolved that the UFT will not support any political candidate who is against the affordable care act or single-payer system. Says in Unity there is strength. Says this is no brainer. Says IDC parades as Dems. We ought not to support pols who don’t support us. Dave Pecoraro—Moves to divide resolved with ACA and single payer. Says we have reality, fighting to keep ACA alive. Maybe in 2021 we can debate single payer. Says eventually there will be two separate votes. Mel Aaronson—against both amendments—would make UFT one issue organization. Says we wouldn’t be able to support people who otherwise support us, would make us irrelevant. question called on all matters by UFT special rep. Chair asks if endorsements are timely. No, says Egan. Initiative on Voter Registration—Janella Hinds—42% of Americans didn’t vote. 6th congressional district engaged people. NYS requires HS students to study government participation. This resolution says we will work with community based organizations and help students to vote. Asks for support. CL—Rises in support. Was involved in school registration drive in middle school. Says voting discussions very rich. Paul Egan asks for extension, 6 PM, Mulgrew grants it without vote. For Gonzalez Brooklyn and Vance Bronx. Mulgrew does raffle. Speaks of raise. You May Not Be a Nazi. You May Still Be a Bigot.